Today was the last day of school for the children here in Bali. They will have from two weeks to a month of vacation before returning to another 6 day a week school schedule. Thanks to your donations, A Heart For Children has set up a fund and interviewed the parents living in poor villages, who have children that are transitioning (needing different school uniforms) from Kindergarten to 1st grade; from Elementary to Jr. High and from Jr. High to Sr. High. These selected children will receive scholarships for their school uniforms fees and yearly tuition fees. 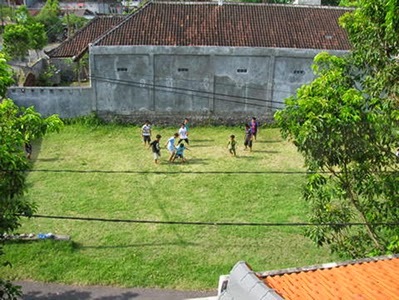 It's normal for children from poorer rural areas to start working to help support their family because the Indonesian government does not have free public education beyond grade 6. Our Kindergarten class of 12 students has come to an end. Even though it has been a rewarding experience, we have decided that we will not commit to starting another class next school year. Our daily schedule at the Training Center….. Kindergarten students arriving at 7:00 am and leaving at 11:00 am 6 days a week… and Elementary and Jr. High students arriving at 12:30 pm and leaving at 5:30 pm… has kept us very busy. With our morning free it will give us more time to focus on the needs of children from poor families living in remote villages. Like little Putu here holding the camera case. 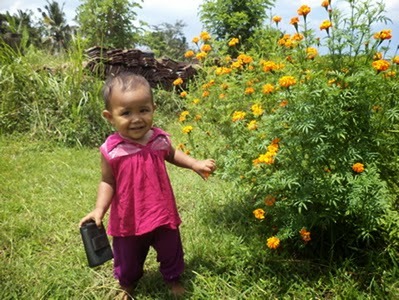 For the next month our Bali Training Center will have an overflow of children. Since school is out there are very few places for the children to congregate and have activities. Many of our regular students will be bringing their friends .. so this is a wonderful opportunity for us to show all the children our Christian hospitality. Thank you all for your prayers, your encouragement and for supporting our Bali Training Center activities, our widows, orphanage and children’s healthcare funds and for sponsoring children in our rural educational fund.